Started 3 years ago (2015-09-28T06:00:00Z). Ended 3 years ago (2015-12-21T06:00:00Z). Your princes and/or princesses can be whatever you want: humans or not. They could have cool outfits and superpowers--or not! Research each planet to incorporate any symbolism or mythos or create your own. When this streak is complete, you will have 12 fully rendered drawings to put into your portfolio, turn into an art book, etc etc! Mercury is a small yet fierce firecracker, who dashes through the space, leaving behind a shiny sodium trail wherever she goes (hence the long "tail"). I spent a lot of time on this one but never really got her into a place where I was inspired by her. I was trying to channel the swirling patterns on the planet, the colors from photos, and the idea of Jupiter being the god of the sky and thunder. I like the lightning, the lighting around her body, the color, and the swirls, but there was just something about this that felt sort of bland to me. She doesn't feel unique or special. If I had more time, I would have redrawn her from scratch. I'm really proud of this one, although the details of the piece get a bit muddled with some of the color and shading choices. The drawing actually looks best against a white background, but for consistency with the rest of the series, she's on a black background here. In this one I wanted to focus on trying to transition her brown feet to a green torso, making her body look like a plant stalk, while giving her bright, green hair as her "leaves"
I was at a loss at first not having a Sailor Scout to base my concept off of when the Neopets Earth Faerie came to mind. I began looking up Tinkerbell reference images, knowing I didn't want just a cute woodland fae to exemplify Earth. 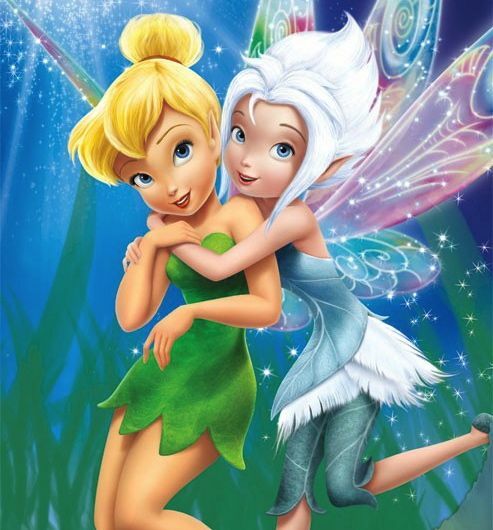 I quickly discovered Tink's sister Periwinkle and how adorable they are together. With a little help from watching too much Steven Universe, I had my Earth idea! I started with the hopes to self teach myself how to draw digitally. I wasn't getting the outcome that I was hoping for but what I do have is the rough sketch. I promised myself I'd turn something in regardless of how discouraged I'd feel. I love astrology, myths, and folklores so when this came up I saw it as an opportunity to flex some cobwebbed creative parts of my brain. I'm used to Greco-roman myths of Venus and wanted to see what other cultures had to say about these planets and gods. Inanna is a Mesopotamian version of Venus. She rules love, wisdom, fertility, lust, and war. She is depicted as a beautiful woman with a lion under each foot representing the morning star and the evening star. I used the two lions in the sketch as transformational light as Inanna becomes her superhero alter-ego. I hope to work on it some more in the near future. I have multiple submissions for this one because I wasn't happy with the original Venus and then decided to redraw her. When I first started drawing this week, I desperately wanted Venus to be sort of "bubble gum pop" and I wanted to play with drawing curly hair. What I didn't keep in mind was how important it is to me that the characters I create in this streak look good together as a set. Mercury was sort of tarot card inspired so to keep that going, I've scrapped original Venus (still posted here) and redrawn her. This was me channeling an oil pastel drawing I once made of Jean Grey/Phoenix, so this is tarot + X-Men inspired.